Well, he got his second chance and when all was said and done, he went 0-2 inside the Octagon. Apparently high-level MMA isn’t for CM Punk. Former WWE Superstar Phil “CM Punk” Brooks lost a unanimous decision to fellow 0-1 MMA fighter Mike “The Truth” Jackson in the opening bout on the UFC 225 pay-per-view card in Punk’s hometown of Chicago, Illinois on Saturday night. Punk came out looking decent in the first round, winning the round on many media members and fans scorecards, however from that point on, things got ugly. Fatigue set in and the lack of experience shined through as Jackson took over the fight en route to a unanimous decision victory on judges scores of 30-26 x3. Check out video highlights of the CM Punk vs. Mike Jackson fight from UFC 225 below. 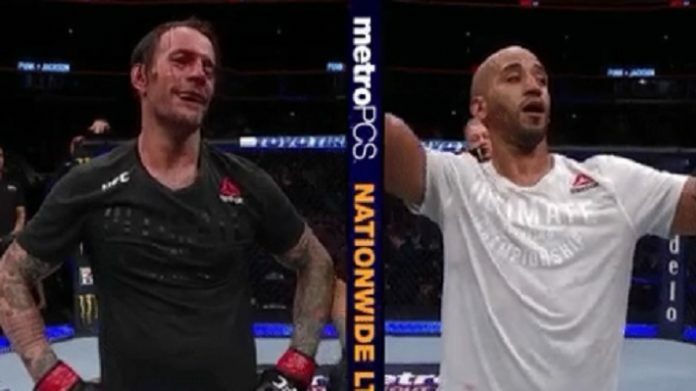 What did you think of the CM Punk vs. Mike Jackson fight at UFC 225? Sound off in the Comments section below.